I served these at Easter with some crusty bread with wine before dinner. It's a great little nibble for guests as they arrive and get settled. We always love marinated olives when we are out for Tapas or even at one of our favorite Lincoln Square restaurants in Chicago called Fork. They always have a seasonal marinade of olives you can order while you are perusing the menu, and they are amazing. Every time we have them we always say, "Ya know, we can do something like this at home!" and we finally tried it and it was a HUGE success. It has also inspired me to write an in depth olive primer post for my readers, which I am currently working on. It will be complete with my hand-done illustrations of olives!! (I have to use that college illustration degree where I can, but boy am I rusty...) SO stay tuned! Mix all ingredients in a tall, slender storage bowl that fit the olives somewhat snugly. This is so that you need less olive oil to cover the olive mixture. Larger, flatter bowl means more olive oil and that gets very expensive. 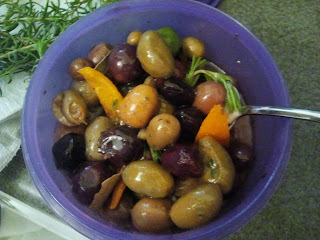 So mix it all, cover with olive oil until all olives are under oil. Cover tightly with a lid, and store in the fridge for at least two days, if not more. Stir once a day. When ready to serve, let sit out at room temp for about one hour to loosen and let the flavors come to full bloom.